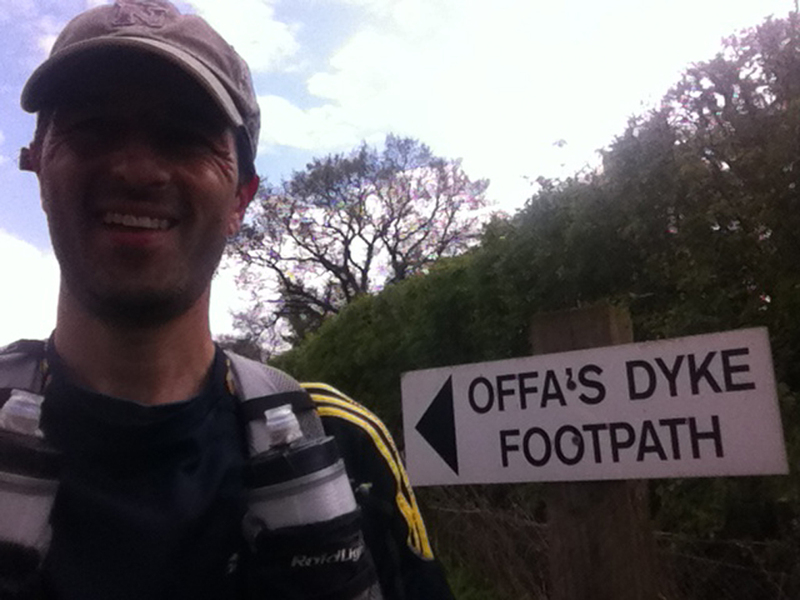 Stouty and I undertook our final charity run last weekend, the plan was to cover the full 177 mile length of the Offa’s Dyke trail over 3 ½ days in fancy dress (Batman & Robin). It didn’t quite work out as planned in the end but I’ll get around to that shortly. Day 0 – We travelled to Prestatyn on the Thursday courtesy of my Mum and Dad (Gaynor & Baz) who had planned a couple of days away sightseeing in the area. The plan had been for us to stay in the same hotel with them for the first couple of nights and they would transport our overnight bag to our final destination and we would be unsupported during the day (unless there was an emergency). For the second half of the trip, one of Stouty’s friends (Paul) would be travelling and staying near us overnight and would transport our overnight bags for the last couple of days. The weather on the way up was a little miserable, as it had been for the previous month. The forecast had suggested the weather would improve over the weekend and we were really hoping it would. After arriving at the Rhuddlan Premier Inn, we travelled to the start in advance of the next day and got a few pictures on the beach before heading back to the hotel for an evening meal before retiring for the night. I should add that I suffered a minor knee injury a week or so before, not enough to prevent me running but a little discomfort but there was no way I was going to postpone the run as all the arrangements and hotel bookings were in place and paid for. 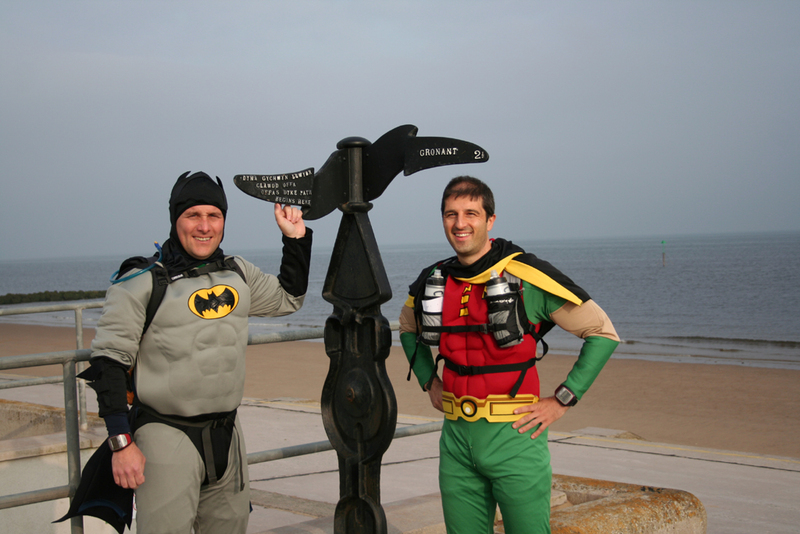 Day 1 – We set out from the beach in Prestatyn dressed as Batman & Robin, the weather was fresh but clear earlier on as we ran out of the town and headed towards the first hill. This was probably the first time, we’ve self navigated and I should admit we made an early detour off route and had to pick up a country lane before getting back on the trail, after that I ran with a map in hand. I did learn that if you are self-navigating you need to keep a thumb on where you are and track your progress along the route to keep on track. Despite the fact that this was a marked national trail it can be quite easy to miss a turn or head along another footpath especially in the forested areas. There were also a few points where the route marker suggested you go over a hill but it wasn’t completely clear whether this was over and left, over and straight on or over and right. We found the first 25 miles to be quite hilly and tough, unfortunately I aggravated my knee injury, which slowed our progress. We were carrying water supplies and food and were going to rely on what we could find en-route. Unfortunately, there were no stopping points en-route to collect supplies during the morning and we ran out of water at some point having drunk more than expected due to the exertion on the hills. We plodded on looking for water but found from other walkers we were several miles off any point and in a moment of desperation looked to fill our bottles up from a water trough in a field, which was full of rainwater. Thankfully, a random walker we had passed and spoken to earlier had taken it upon himself to get us a few bottles of water and drove ahead to meet us and provided us with some supplies for which we were most grateful. The day did drag on as we plodded on as best we could and the weather became more overcast. We stopped at a Café at about 4.30pm for a toasted sandwich and a bottle of coke, which gave us the pickup we needed to head out again for another few hours. It was obvious at this point what we were not going to hit our ambitious mileage target for the day and eventually decided to call it a day about 12 hours later having covered about 46-47 miles due to fading light (we did have head torches just in case) but mainly due to logistical reasons of getting to a pickup back to the hotel and eating. We got back to the hotel, showered and had a meal about 9.30 – 10pm at night. The fancy dress costumes were washed around 11pm at night but unfortunately didn’t dry enough for us to use them the next day. Day 2 – After discussion the previous night, we decided to start at our planned point from Day 2 which meant we lost about 12 miles on Day 1. We spoke about perhaps trying to make a few miles up each day by covering part of the route again but this wasn’t a realistic possibility. I awoke quite early and really didn’t fancy getting out of bed at all, it would have been quite easy to just stay in bed and forget the rest of the run. How some people manage to do this for long multi-stage events (a nod to James’s Run Across America or the JOGLE) and psyche themselves up every day shows real mental strength. We set out with my knee heavily strapped but I found it difficult to run more than 200-300 yards without experiencing pain in the knee, the result was which was a steady march for the majority of the day. The first part of the route was thankfully flat which followed a canal (Shropshire Canal I believe) before we hit some muddy fields. The weather for the day was generally was overcast with a few showers. We had another couple of detours en-route aswell due to a combination of confusion with other footpaths crossing our route, some trail markings not being precise and perhaps a lack of attention on the map! We finished the day covering about 37 miles feeling sore, tired and perhaps flagging mentally. Day 3 – We awoke early (again). Stouty couldn’t walk let alone run and so a decision was made to head out by myself for the day. Knowing, I wouldn’t be able to cover the planned 46 mile distance I was dropped off further ahead than the start planned point with the aim of getting to Monmouth about 36 miles ahead. The knee actually felt better than the previous day and was just about runnable after the first couple of miles. 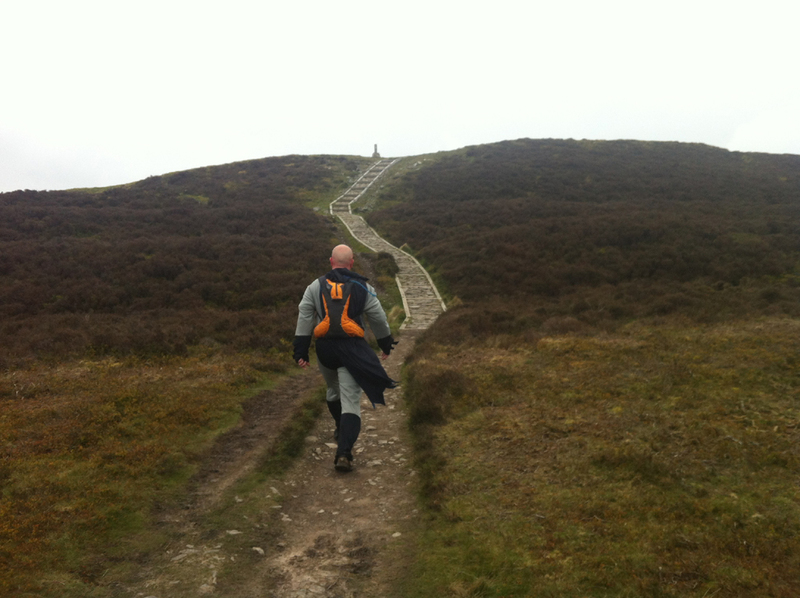 I covered about 18-19 miles along a ridgeway before meeting Stouty at Pandy for a sandwich before heading out again. It was a pretty lonely experience but it did give me a chance to catch up on a few episodes of Talk Ultra. 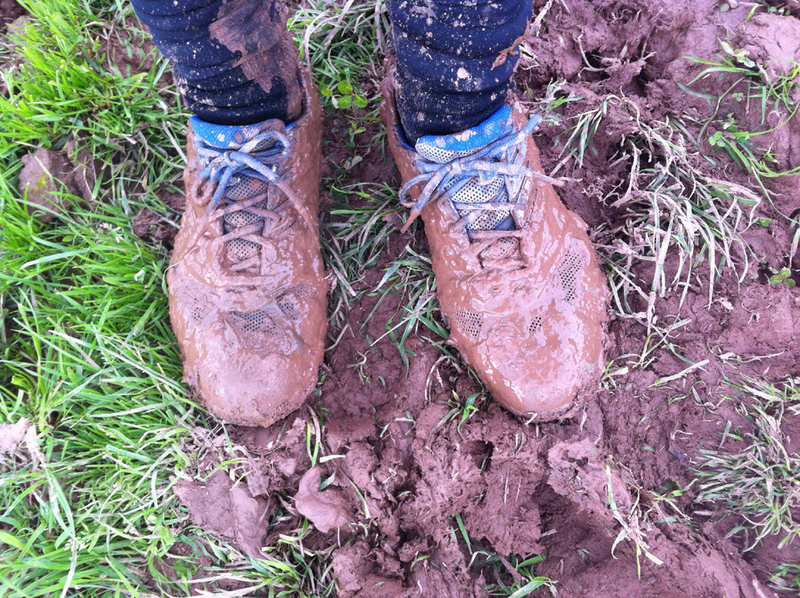 Some of the track conditions in the afternoon were wet and then terribly muddy thanks to all the recent rain and my shoes were absolutely caked in mud by the end of the day. The knee did start to cause some discomfort in the afternoon leading to a bit more walking then running but I managed to plod through about 36 miles in total but made it into the planned finish point at Monmouth. Apparently Stouty had a lovely day with support crew member Paul wandering around shops and drinking coffee. 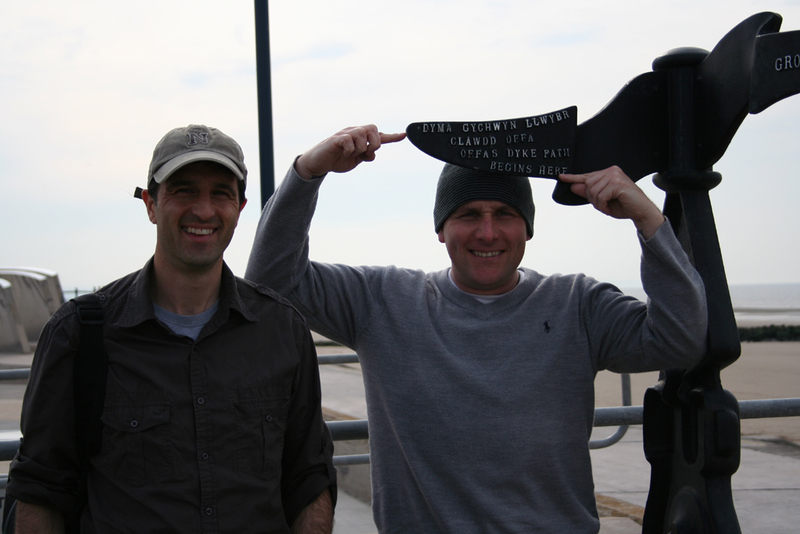 Day 4 – Unfortunately there was no miraculous recovery from my Stouty and I set for the final 20-21 mile leg by myself. I debated wearing the fancy dress costume (as Robin) for the finishing leg but there seemed little point without Batman. This decision was confirmed when it started to rain heavily after breakfast and the full set of waterproofs were required. I decided not to bother carrying a pack for a short leg and simply put mobile in one pocket, a kit-kat in another with a couple of quid, water bottle in one-hand and map in another and set out. The last leg was probably my favourite part of the route. 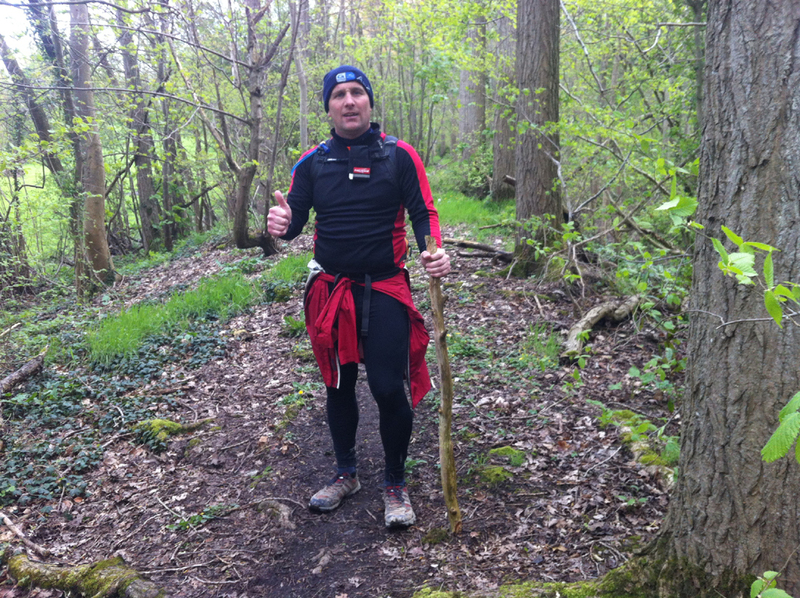 No severe hills and some good forest trail sections, the fact that my knee was improving steadily and I could run a bit and was getting close to the end were all contributory factors. Unfortunately, it poured solidly for the few hours I was out, the denser forest sections almost felt like a jungle with the rain and mist around. I did lose the trail at one point when I branched out onto a footpath but managed to pick up the correct trail again as I headed towards Sedbury. I recall passing a sign saying Sedbury Cliffs 6 ½ miles which gave me a bit of lift knowing it wasn’t far to go to the end. 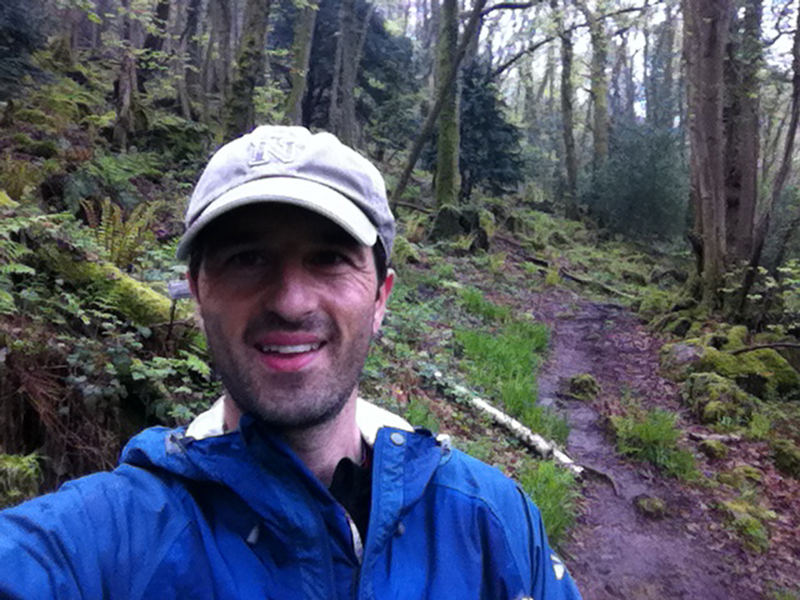 I plodded along the trail route, some of which was a little rocky and slippery as I nearly stumbled over once or twice thanks to the wet and muddy conditions but finally exited the forested trails and headed along some minor roads to Chepstow and Sedbury. These last couple of miles went quite quickly and before I knew it, I had arrived at Sedbury and was less than a mile from the end and I could see the Severn Bridge in the distance. I made a quick call to Stouty who was waiting at the end and to my wife who was heading there to meet me and plodded the last mile to the end. The finishing point was a bit of an anti-climax . I had envisaged running over a stony cliff and descending upon a beach, kissing the stone marker and then jumping into the sea. 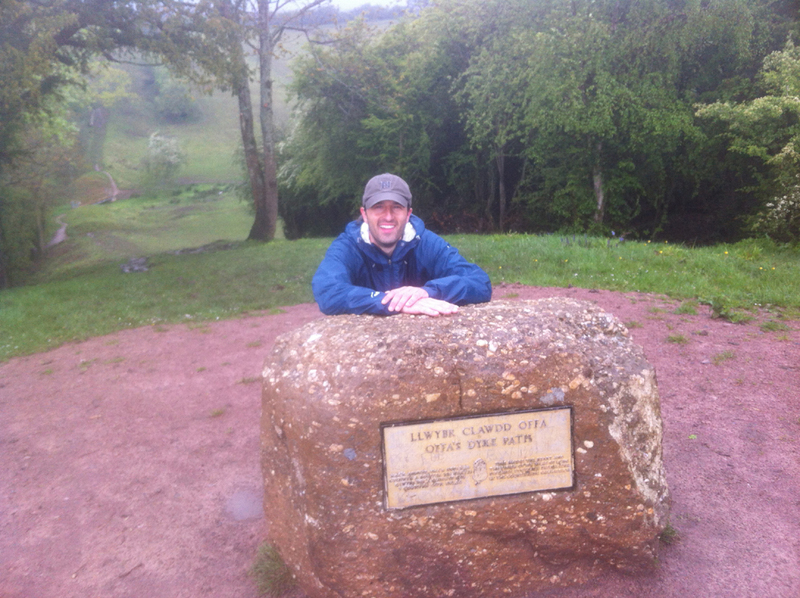 In reality, the stone marker was placed on top of a small muddy hill in the middle of a cow field. I made a last effort through the field to see Stouty and Paul waiting for me by the marker, I had finished! 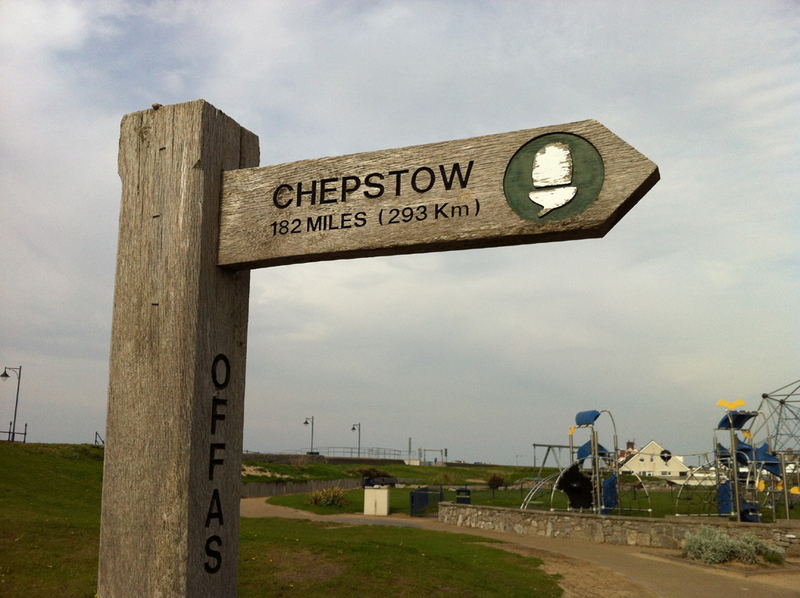 Not quite the full distance of 177 miles (probably closer to 140) and not in the manner we had intended (i.e. it was more slow climbs, marching and plodding as opposed to Batman & Robin flying across the hills and fields) but I had gutted it out for each day so there was some satisfaction in actually getting to the finish. My wife and daughter (Sally-anne & Annabelle) met me at the finish and I removed my wet clothes, put on some dry ones and jumped into the car to head home. That was it, the adventure was over. A low key finish even by Ultra event standards. It is good that you are joining this kind of activity. This is really a fun run. Congrats.